Fiskars Hatchet Review - Best Hatchet To Buy? This Fiskars hatchet review is designed to do one thing.....give you a detailed and honest product review on a hatchet we use for just about everything. I've been using this 14 inch hatchet for several years now and it's amazing. We use it primarily for splitting kindling and it works great but over the years we've used it for a variety of different household chores. Sure, you could use a larger splitting axe like the Fiskars X27 to split kindling but the smaller frame and lightweight hatchet is a lot easier. Plus when you're doing tedious work like splitting small pieces of wood, a hatchet is a little easier to control. Why did I choose to purchase a hatchet made by Fiskars? Easy......the company produces a great product, they're affordable and we've had great experiences with the Fiskars product line. Well Balanced Design - The hatchet is perfectly balanced and fits comfortably in your hand. Chopping Ability - The hatchet has a ultra sharp blade with a low-friction coating that powers through wood and chops up to 3 times deeper than other hatchets. FiberComp Handle - The FiberComp handle is extremely durable and won't break. The PermaHead insert-molded axe head won't allow the axe head to loosen or fall off. Ultra Sharp Edge - The blade is sharp.....really sharp. Although the blade is soft, it allows you to use the optional Fiskars 7861 Axe and Knife Sharpener to keep a nice cutting edge. Easy Open Carry and Hang Sheath - Protect your investment with a sheath that comes with your purchase. It's really easy to open, it allows you to hang up the hatchet and it protects the blade. The blade on the hatchet is soft. The soft blade allows you to obtain a nice sharp edge but it will dent or chip if you strike something hard like a rock or gravel. To protect the blade, chop kindling on a wooden block or other similar surface. This will keep the blade from digging into the ground plus it's a lot safer. Over time no matter what you do the blade will eventually become dull. 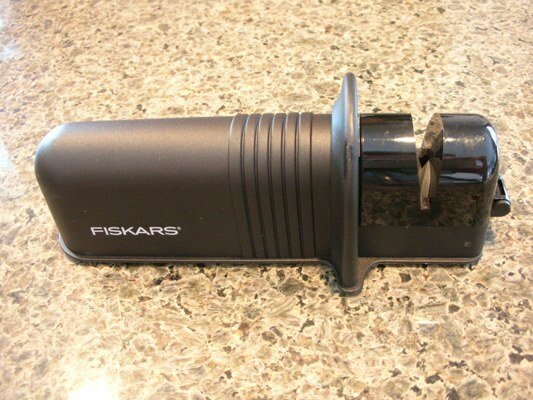 Fiskars offers an optional Axe and Knife Sharpener that works great. You can purchase the sharpener at local retailers or if you do a lot of online shopping like I do, you can get one for a great price on Amazon. Just a few passes through this low cost sharpener will put a really sharp, clean factory edge back on the hatchet. The sharpener also works great on other Fiskars axes and it will even sharpen your kitchen knives! Fiskars has now produced the 7550 hatchet which is very similar to the 7850 model. The only real noticeable difference in their new product line is the full black handle. The new model does not have the orange rubber gripped handle and now has inscribed ridges. I liked the 7850 model so much that I also purchased the new 7550 design! 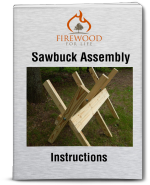 When it comes to processing firewood I'm a fan of anything that makes the job safer, quicker and easier. The X7 hatchet does just that......that's why we decided to write this Fiskars hatchet review! "I have the Fiskars hatchet and the problem with all Fiskars axes and hatchets are if you get into something that doesn't split easy you can't hit the backside of the tool because you'll break it. Unfortunately it's not covered by a warranty! But if there's no knot and it is straight grained it works really good." 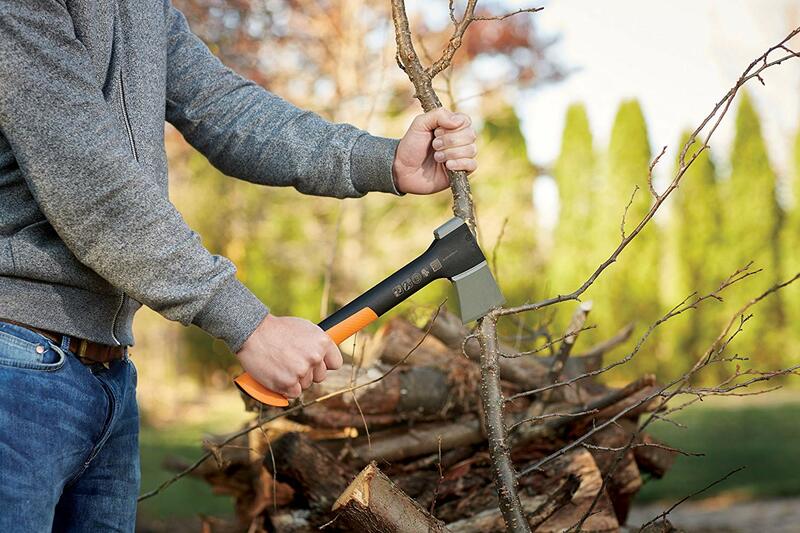 Whether you need a nice hatchet for camping, butchering chickens or just for splitting a little kindling for your fireplace, the Fiskars hatchet is a great choice.